Colin is originally from England, but loves the lifestyle in Australia. They cleared enough of their 5 acre block to build a house, the remander was very deliberately retained as natural bush. He has identified 105 species of native plants including many native Orchids on his block and has taken a few hundred photos. He has now set about planting many more, with the intention of documenting the native plants of Western Australia. He is also undertaking a study for (CALM) Conservation & Land Management because he has a rare species on his block & they want him to do a study of it for them, eg flowering time, type of pollination etc. From his emails and the photos he has sent me, I can see he is very passionate about these projects. The finished article will make a fantastic database, which when put on a SWAP CD can be shared,or marketed commercially. He also finds time to do Landscaping work for a living! 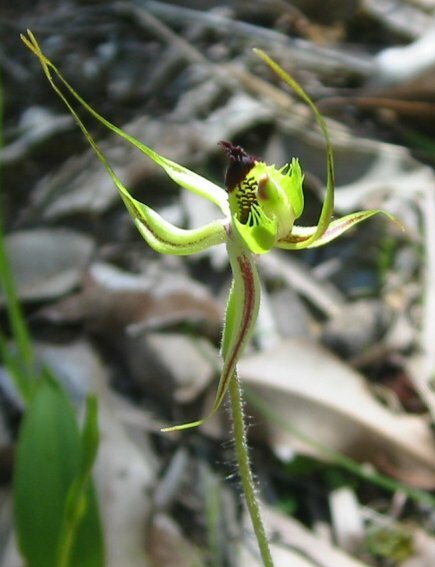 The fantastic photo below is Caladenia falcata, or Spider Orchid (Caladenia is Col’s favourite genera), a tuberous perennial herb .3 to .4 m tall. Growing on yellow or grey sand, clay/loam or granite outcrops.